Description: I want to show my last bullet or whatever you call simple diorama in 1/35 scale. 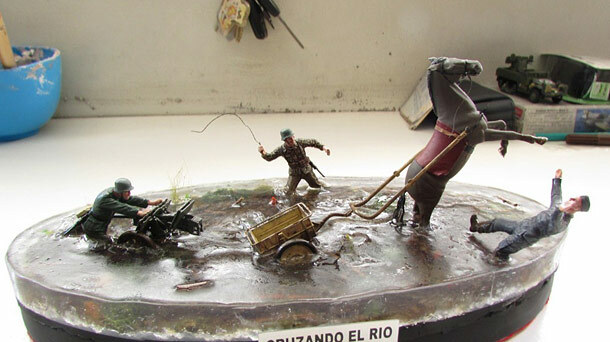 The following review crossing a rushing river with a horse pulling a small artillery, horse artillery soldier and falling water are of the Dragon marks the horse came walking and posture is changed with epoxy putty to represent anger and fatigue spanking horse and load, the soldier with the whip is launching a Tamiya was Granada and buy it by the position finally brand Miniart figure pushing the artillery is coming pushing barrels. Water is made ​​with clear resin and waves with transparent fastix. Various materials such as cat litter, vinyl glue, pigments, oils, epoxy putty, and various paintings of Vallejo, Tamiya etc were used. Note: I still do not know what I'm going to be putting the cart secure weapons and other things, is for later.